ROMACKcrane offers all the products required for the installation of crane rails. Besides clips and pad we offer advice on design and installation. We are then able to supply rail and all other materials as well as a full service to support all stages of the installation process. This can go right through to care and maintenance phases. 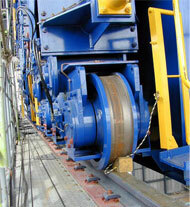 We can supply the right rail and related equipment for the job. Copyright © 2011 Romackcrane. All rights reserved.